As box office finals go you don’t get much bigger than this, with two of Europe’s most famous clubs clashing in the Champions League decider. Juventus vs Real Madrid kicks off at 19.45 in Cardiff and you can catch all the action live on BT Sports. If you are having a bet, check out our preview and exclusive prediction below. Before you put your money down, you should check the best available free bets and promotions. Juve have lost just 1 of their last 5 meetings with Real Madrid. The Italian Champions have been ultra-impressive in the Champions League this season. Not many expected them to overcome Barca in the quarters, but they beat the Catalans comfortably. Monaco were dispatched in the semi-finals with the minimum of fuss, and Juventus will be a tough nut to crack in this final. They are strong at the back, good in possession and in Higuaín they possess a striker that can score goals. If any man deserves a UCL winners medal it is the evergreen Gigi Buffon. The Italian maestro is still one of the best custodians in the business and he won’t be beaten easily in Cardiff. Manager Massimo Allergri opted to play with three centre backs vs Barca, and he could do similar here. Barzagli, Chiellini and Bonucci could all start, with Alves and Sandro filling the wing back roles. Miralem Pjanic has filled the considerable void left by Pogba and both he and Marchisio have struck up a good understanding in midfield. Dybala has looked lively and his pace and ability to beat a man could be key vs Madrid. Mandzukic will work his socks off and he could pop up with a goal. Higuaín is their top scorer with 29 goals, and he usually puts away any chances that come his way. Madrid need to keep a close eye on him on Saturday. Zinedine Zidane was one of the greatest midfielders to ever kick a ball, and he has taken to management well. The French legend has already sealed the La Liga title, and he is looking to win the UCL for the second year in a row. Madrid held off the late challenge of Barca domestically, and Ronaldo has fired them to the UCL final. They beat great rivals Atletico 4-2 in the semi-final, but Juve will be a different proposition. Keylor Navas will start between the sticks for Real and he is usually reliable. He will want to put in a big performance with Madrid looking likely to sign De Gea this summer. Pepe is injured so Varane and the vastly experienced Ramos will start at centre back. Carvajal is another doubt so Danilo could start on the right. Marcelo has emerged as the best left back in the World, and his battle with Alves will make for fascinating viewing. Casemiro will sit deep in the Madrid midfield and Modric and Kroos will look to dictate the play. They are cool in possession and Modric has had a fantastic season for Madrid. Bale is injured, so Isco could start alongside Benzema and the main man Ronaldo. He has continued to score goals for fun this season and age is showing no signs of catching up with him. However, he is up against the best defence in Europe and he might struggle to add to his total of 35 goals. Injuries Suspensions Real Madrid: Pepe, Bale, Carvajal, James. Juventus: Buffon—Alves Bonucci Chiellini Barzagli Sandro—Marchisio Pjanic—Mandzukic Dybala Higuain. Real Madrid: Navas—Danilo Varane Ramos Marcelo—Casemiro Modric Kroos—Isco Ronaldo Benzema. Juventus: 19/10 Betfair. Draw: 23/10 Skybet. Real Madrid 33/20 Marathonbet. This has all the ingredients to be a classic UCL final and it will be a fascinating clash of styles. Juventus are a side packed with experience and the spine of their team is rock solid. Real opt for a more flamboyant approach and they rely on individual moments of brilliance to win games. It will be interesting to see if Juventus can put the shackles on Ronaldo, and we think they can. Allegri is likely to stick with the same system that worked so well against Barca. They scored 3 and conceded none against the Catalans, and we think they can repeat the trick against Real. 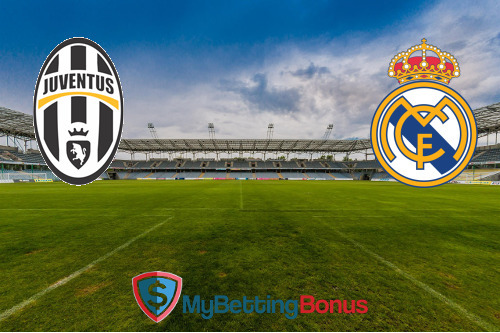 Our exclusive prediction for Juventus vs Real Madrid is the Juventus win to nil at odds of 8/1 with Bet365, who offer a whopping £200 sign up bonus to new customers.